The complexity and magnitude of the challenges facing health research today require the convergence of expertise and resources of researchers from different disciplines and institutions. The RRI and KLARU have taken substantial steps to address these challenges through their extensive involvement in several prominent research networks. Baycrest serves as a hub, radiating its expertise both nationally and internationally. Some of these alliances, such as FIRN and the FTD consortium, are foundational and set the stage for future research, while others are continually evolving collaborations focused on common research goals. Taken together these networks encompass a broad array of research from optimization of neuroimaging techniques, to clarifying the symptomology of cognitive disorders and dementias, to innovative stroke rehabilitation approaches, to improvement of care and the quality of life of the elderly population. 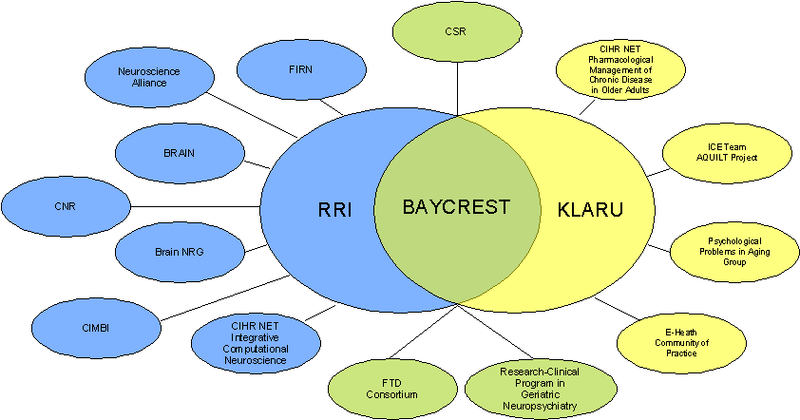 It is the focus on collaboration by both RRI neuroscientists and KLARU clinician-scientists that promotes the synergistic progress of these networks.